Virtual reality has attracted the interest of the research community due to the endless possibilities itoffers in the educational arena. Although a wide range of applications already exists, further researchis required to establish effective practices for a fruitful classroom implementation. This quantitativeresearch of a sample of 37 primary school students explores the educational affordances and students’perceptions of virtual reality systems as supportive tools for teaching English as a foreign language. is a relatively new application that stands out from the plethora of Virtual Reality tools for learning foreign languages ​​that are available nowadays. The main reason for that is the excellent quality of the graphic depictions in the application. High-quality 360 ° panoramas are able to offer the user the viewing of environments in a natural way therefore enhancing the immersion of use, while limiting possible feelings of nausea due to the use of the medium. The user through real life scenarios is required to complete activities by locating objects. For example, starting from his bed, the user is asked to locate his slippers in order to get up and then he has to find the door to get to the bathroom. The instructions for the execution of these actions are in English through incitements and natural expressions. This visualization of the necessary information will strengthen the imprinting on the user's subconscious, as it helps him to connect the new knowledge with real objects, in a really efficient way. Panolingo - Learn Languages ​​in VR offers a point system, personal progress check and leaderboards for enhanced competition. Those features support the enhanced maintenance of the user's interest over time.Finally, it should be noted that there is also a conventional version in which the use of an HMD is not required. With regard to its technical features, the application works seamlessly with the most popular HMDs such as Google Cardboard, Oculus Gear, Archos VR etc. At this stage, it is only available for Android but will soon be available for iOS devices while adding more languages ​​other than English.In conclusion, Panolingo is an excellent solution for a home-based tool, and is aimed at teachers who want to introduce Virtual Reality technology into the learning process. According to Gee's evaluation criteria (2003), educational video games must be pedagogically driven and appropriate to promote learning. These criteria refer to the motivation given to the student when using the application or game, the potential problems he / she will be faced with and his / her level of interactivity. Johnny Grammar's Word Challenge is an application suitable for Android and IOS devices. It is really beneficial for students who learn English and want to improve their knowledge of grammar and vocabulary. The aim of the game is to answer as many correct questions as possible within a minute, with the user receiving badges depending on his performance (Grammar Guru, Word Wizard and Supreme Speller badges). 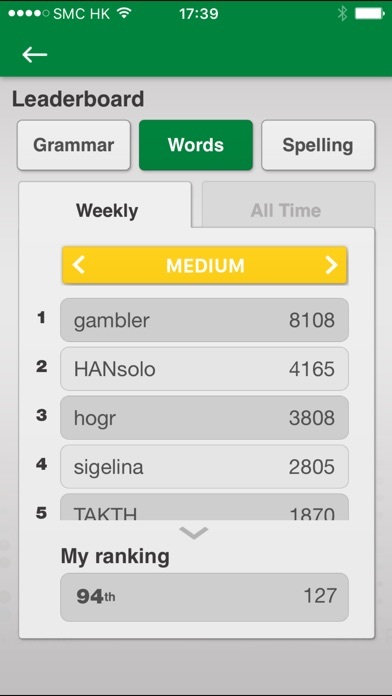 By winning badges the player is placed on a leaderboard competing with other players worldwide. There are three levels of difficulty (easy, medium and hard) depending on the level of questions asked. In the vocabulary category there are 10 sub-categories related to food, travels, idioms, movies, hobbies etc. In the grammar category there are 12 sub-categories related to intentions, irregular verbs, auxiliary verbs, etc. After completing quizzes, the application offers feedback so the user can evaluate the answers given. In fact, through this gamification process, the user indirectly aims at improving the cognitive knowledge’s capacity as this improvement will also lead to a better placement in the ranking board. Assessing the "Johnny Grammar's Word Challenge" application with Gee's criteria for mobilizing the student, this game is structured in such a way that it makes the user feel that his action have a meaning (Gee, 2004). Problems in the application are well organized as there is a scaling difficulty so the learner can easily start from the lowest level of difficulty and reach the highest, making the challenges easily manageable (Gee, 2004). Another advantage is the immediate feedback given as the student quickly acquires an image of his level and knowledge. This is a valid update on the processes that should or have been applied, which serves in understanding and building new knowledge. After all it is widely known that people learn skills, strategies and ideas better when they see how they fit into a more general frame which is meaningful for them. In fact, every experience is reinforced when we understand how it fits into a more important set. Gee, J.P. (2004). Learning by design: Games as learning machines. Interactive Educational Multimedia, (8), 15-23. The integration and exploitation of technology in in recent years takes place through pleasant environments of learning, collaboration and authenticity. Such an environment is the Quizizz. It requires the student's active engagement and the emergence of a learning experience that no longer relies on the sterile knowledge of the content. The use of such tool keeps students' interest and commitment to acquiring new information (The effect of Kahoot, Quizizz, 2017). 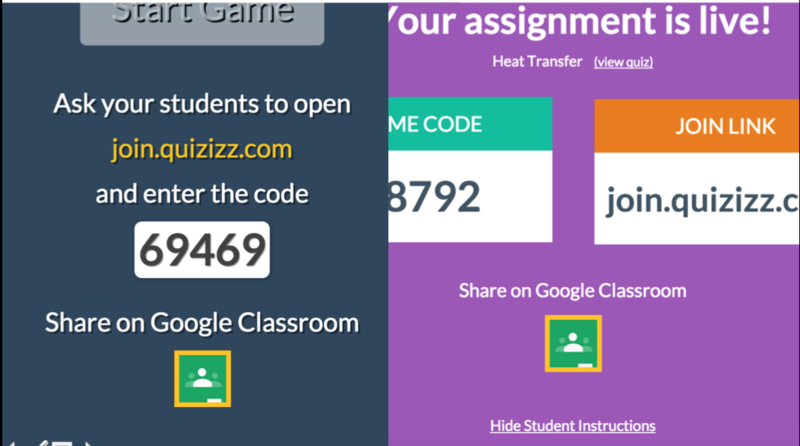 Quizizz is a free learning application designed for mobile phones that uses wireless handhelds to collect student responses and then show the results in the classroom while collecting direct feedback by answering questions posed by the educator (Kahoot, Quizizz, 2017). The teacher selects a quiz that has been structured for the particular subject of interest and then provides a pin for the students. Students then use the pin and the questions appear on their mobile devices. They are required to answer a timeframe predetermined by the teacher. Questions appear randomly to each student, and then the learner observes the results of the choice he/she made (Boulden, Hurt & Richardson, 2017). The total results are also shown at the interactive whiteboard with the help of the teacher’s computer and a projector. Students play together, but each at their own pace. Gamfication elements like avatars, leaderboard and funny memes add to the fun. At the end of the game, the educator receives detailed class and student-level reports to understand where the pupils need help. It is a tool based on behavioral learning theory as learning through quizizz is done with specific activities to achieve goals that are designed by the teacher (Learning Theories, n.d.). Thus, the student is not in control of the application since the teacher is the creator. As far as the evaluation of the learner is concerned, the behavioral patterns are also followed, since the results of the quiz appear at the scoreboard. By studying the positive results in the learning process, many pedagogical benefits are attributed to Quizizz. Students perceive commitment and acquire a different perception of learning as their motives multiply (The effect of Kahoot, Quizizz, 2017). Studies show increased collaborative learning and engagement as well as increased learning outcomes (Boulden, Hurt & Richardson, 2017). Then the concentration of children in the process increases as well as their active engagement (The effect of Kahoot, Quizizz, 2017). As far as the teacher is concerned, the contribution of the tool is to control the level of understanding or lack of knowledge through the feedback system provided at the end of the process. In conclusion one could imply that the inclusion of games and technological tools offers all the resources to students for communication, contact and collaboration. In the context of teaching, the tools that technology has provided us, ensures a more extensive and cost-effective exploratory work on the subject of teaching (Cardet, 2013). Boulden, D. C., Hurt, J. W., & amp; Richardson, M. K. (2017). Implementing Digital Tools to Support Student Questioning Abilities: A Collaborative Action Research Report. I.E . : Inquiry In Education, 9 (1), 1. CARDET (2013). Authentic Learning. Report within the project Developing Authentic Learning Environments through School and Business Collaboration. Nicosia: CARDET Press. Vocaroo is a particularly useful tool especially for educators that teach teach foreign languages. It is available at no cost and allows the voice of the user to be recorded, allowing him to download the soundtrack to his computer, send it as an e-mail or share it directly on a social network (Charles & Dickens, 2012). Its possible uses in the learning process are many, ranging from creating Podcasts, transmitting messages between students and teachers, reading short stories, and providing feedback to third parties (Charles & Dickens, 2012; TeachersFirst, n.d.). Depending on the activity that will be requested by the student, the tool can function as either constructivist or behavioral, but the widest range of exploitable activities can be found under the "behaviourism umbrella"
Several studies have shown that using Vocaroo as a means of enhancing students' oral speech has ultimately led not only to the improvement of this but to the general perception and expressiveness of its users (Kim, 2014). Students' language skills also improve as pupils can repeat the activity as they wish and as many times as they want, while promoting self-assessment building on new knowledge, giving them learning autonomy (Kim, 2014; Budaghyan, 2015). One of the great advantages of Vocaroo is its ease of use as it does not even need to create an account to use the service, making it extremely easy to be used even by the most inexperienced person(Charles & Dickens, 2012; TeachersFirst, n.d.). Charles, K.J., & Dickens, V. (2012). Closing the Communication Gap. Teaching Exceptional Children, 45 (2), 24-32. Games in education are the teacher’s weapon to try and involve students in activities that combine the element of fun and learning with a meaning. Mobile devices have reshaped the way of teaching and have created new opportunities towards this approach. 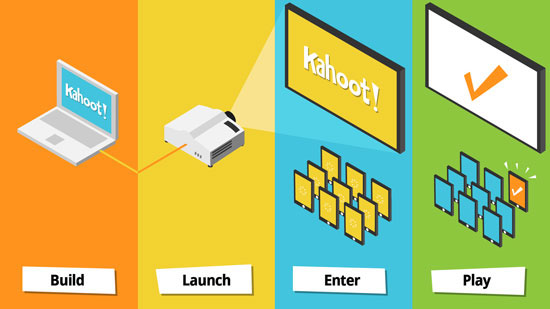 This article will present one of the most useful tools, Kahoot! which combines beautiful graphical representations and sounds, turns the classroom into a playroom, with the teacher being the "show" coordinator and the students to be the contestants (Fotaris, Mastoras, Leinfellner & Rosunally, 2016). Students are asked to give the appropriate answer to the current question they are dealing with using their mobile devices and according to their responses they earn points that rank them in a rating scale (Wang, 2015). If used properly, It has the potential to create a social, fun and game-like learning environment. Dellos, R. (2015). Kahoot! A digital game resource for learning. International Journal of Instructional Technology and Distance Learning, 12 (4), 49-52. Fotaris P, Mastoras T, Leinfellner R and Rosenally Y (2016). Climbing Up the Leaderboard: An Empirical Study of Applying Gaming Techniques to a Computer Programming Class. The Electronic Journal of e-Learning Volume 14 (2), 94-110. Wang, A. I. (2015). The wear out effect of a game-based student response system. Computers & Education, 82, 217-227.